Sugar & Spice has just received its 5th 5 star review in a row. People have said it is a ‘love it’ or ‘hate it’ book. I can take that. Either way, people are talking about it…BUT, we are selling thousands more copies in Europe (UK primarily) than on .com. Why? We even re-wrote it for the US market. It’s going well, made a steady start, but it isn’t setting the world on fire. are we just being too ambitious? 3,657 out of 750,000 books without an agent or publisher or any kind of advertising… in less than 6 months? My two cents as an American who has lived in London for the last few years. First, the .com site doesn’t have a blurb. I have NO idea what the book is about unless I scroll through the reviews. While this is true of the UK site, America is a fast food nation. Without a blurb, people are much less likely to buy it. The subject matter is a touchy one for Americans, too. We’re much more likely to put up with extreme violence than we are anything of a sexual nature. And this particular instance is highly taboo. Wishing you HEAPS of success! That could be the case Shea, very much so! 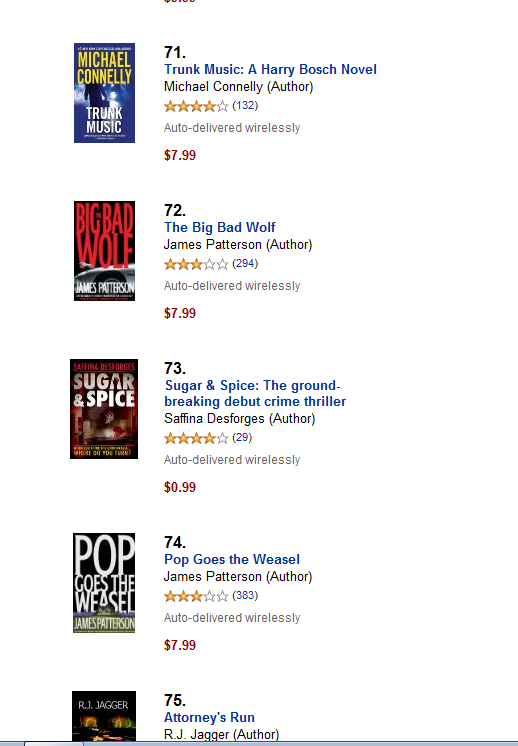 The other unanswered question is why on earth James Patterson’s backlist is being sold at 7.99 per time as an ebook? What justification can there possibly be for a price like that on an old backlist book download that has paid for itself a million times over? I could buy eight indie books for that! In fact, if there’s any money left over from the royalties once Saffi’s refurbished the diving jacuzzi on her private jet in pink fur I think I will. They sell them for $7.99 because customers will buy them for $7.99. I’ve bought coveted ebooks for the paperback price myself. Bright-side, this means that Kindle readers are willing to pay that high for established names–when we’re established names we’ll be selling our own books for more than $.99. That’s an interesting one, George. If we end up signing with a traditional publisher at some stage we’d lose control over things like pricing, but as indies I would be seriously uncomfortable charging large sums for an ebook just because we could get away with it. And yes, while some will pay, isn’t that just ripping off the fans most loyal to you? And deterring new buyers? Keep prices reasonable and attract new readers. Yes, we need to earn a living, but the way to do that is by volume sales. As indie writers we don’t have a huge staff to pay, premises to rent or shareholders to appease, and electronic books do not have the physical costs of paper, ink, printing, distribution, storage and shop-floor costs to take into consderation. As ebooks become the norm the trad publishers, even allowing for editorial staff and all that side of things that will stay could easily deliver at a fraction of the price of a paper book and still make a huge profit. Am I being cynical in thinking prices won’t be coming down to reflect that? Saffi, those figures seem pretty good to me. My experience as wella s what I’ve heard from Jake and others is that indie books just don’t sell equally on either side of the pond. 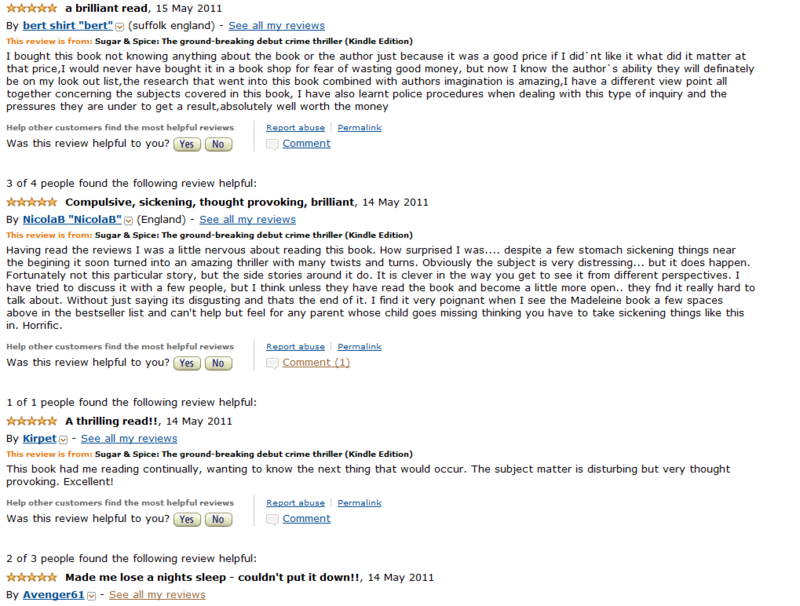 On Kindleboards people say exactly the same about how hard they find it to sell in the UK. I sell about 1 book on .com for every 30-40 UK books, and I thought the Hannibal Lecter/Oxford University mix of The Company of Fellows (http://www.amazon.com/The-Company-of-Fellows-ebook/dp/B004PLMHYC) would appeal bang-on to the US market. I know Jake’s said his ratio is closer to 100:1, and I would have thought likewise for Burn, Baby Burn. I think the two markets just work very differently, and the key is to see each as an entirely separate venture. It *is* difficult not being able to have difefernt blurbs on each site, but you can pitch differently in the forums at least. Anyway VERY best wishes that the US sales start catching up. My own experience, at a much lower consistent level, is that the UK version keeps selling, with ups and downs, but the USA version gives sudden spurts and then halts for a while. The whole area of publicity is a mystery to me, but I keep on trying. Mark, you’ve advised me to run a blog – but I see many writers with blogs who aren’t doing even as well as I am – so what’s the answer? Gerry, a blog isn’t an instant solution, or even a solution at all, necessariily, but in all likelihood it helps. I have no idea how many sales, if any, come directly from visitors to my MWi blog, or how many sales guests on my site pick up. But I can say that, many weeks after you guested on MWi, your feature still gets hits daily. Visitors read the latest post then take time out to see what’s gone before. And these visitors are global, not just friends and family. To compete in that jungle out there we have to do whatever we can to be noticed. A blog is an excellent way of doing that. As writers ourselves a blog is a logical choice, and as Prue said elsewhere, a blog becomes an extension of our writing and a chance to explore ideas, as well as to make new acquaintances in the trade. The hard-sell blogs that only talk about their own work, and therefore attract few visitors, will inevitably achieve nothing long term. But building a blog (and building takes time – just like book sales, it’s not an overnight thing) that attracts readers across the globe helps builds you as a writing brand and establishes your name out there in cyber space, which is key to long-term promotion. Along the way some of those visitors may actually buy your work. But that’s just a bonus. The important thing is to blog enthusisatically, and about what enthuses you. Your readers will tolerate the occasional indulgent self-promo along the way if they know most of the time the posts will be interesting enough to come back for.